I haven’t posted in a while, as I have been busy drafting my second book. But I am pleased to report that the draft is now done and after a brief break, I will begin work to finish the book. If all goes according to plan, the finalized book will be available in early 2019. Overall, I will describe it as the philosophical companion to my workshop-based and more practice-oriented Seven Keys. In particular, the new book explores the natural place, purpose, and power of ideals of all kinds in human life, and thus the nature of overarching goals, aims, and ideas of all kinds too. As such, while the book focuses on twenty-four specific ideals, its ultimate scope is broad and reaching. Today, I would like to explore a powerful topic and tool for modern life and endeavor, by examining the natural processes we use to plan for, organize, and pursue action in our lives each day. As my title highlights, the specific topics I want to consider are primarily our natural capacity for and then the intentional practice of multi-dimensional thinking – or the informing use of multiple variables, factors, or considerations when we think and act. However, this subject involves and therefore encourages us to initially touch on the natural phenomena of cognition and metacognition, or the processes of thinking and thinking about thinking. I explore both cognition and metacognition somewhat extensively in my new book, the latter notably as a tool for considering our dominant ideals, or ideas, and resulting modes of functioning. I also discuss cognition and metacognition, along with multi-dimensional thinking overall, at several points in the Seven Keys. Here, I would like to distill both of these extended discussions into a few fairly simple but important ideas and techniques you can quickly use and leverage. The first of these is the idea that multi-dimensional thinking, and enabling metacognition, each are natural, in humans at least, and also potentially quite powerful. You can immediately understand this power by considering that the alternative is a predominance and indeed prison of single-dimensional, monolithic, or even monomaniacal thinking – and thus naturally simple, crude, or limited thinking – examples of which are unfortunately common in human life and history. At the same time, the power of multi-dimensional thinking also can be understood by seeing it not only as more sophisticated, insight-affording, and thus naturally informing or truing, but as exponentially so, as I will explain. In principle and practice, multi-dimensional thinking can both dramatically increase our information in use, our cognitive richness, and our likelihood of adaptive cognition and metacognition. Crucially, it also can reduce risks of basic error waiting in all single-mindedness and fixed sets of information – risks that are again naturally diminished by expanded information, metacognition, or both working in concert. As my graphical model above summarizes, and as we all can experience, when we think and act, we naturally can be fairly immersed in this process or we can be more circumspect. In the first case, our functioning can be understood as dominated by cognition or mental operations aimed primarily at coordinating our actions and fulfilling our immediate tasks, goals, imperatives, ideas, ideals, or psychological investments. In the second case, we can be understood as increasing our degree of metacognition, reflection, or thinking about our thinking – and potentially, increasing our thinking about the quality, efficiency, effectiveness, or adaptive potential of our thoughts and resulting actions. In personal and organizational psychology, and as the preceding graphic indicates, the processes of cognition and metacognition are often described, modeled, or thought of (reductionistically but often helpfully) as single-loop and double-loop functioning or learning. Here, the concept of single-loop functioning summarizes the idea that in cognition or simple thinking , we are often significantly dedicated to matters at hand and thus less reflective or cognitively observant overall. 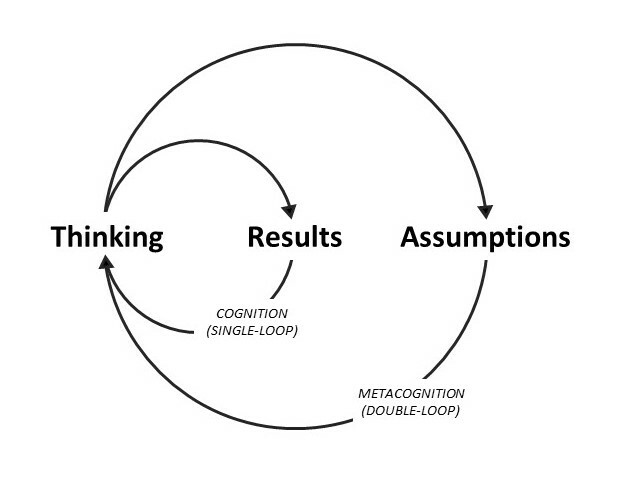 By contrast, the idea of double-loop functioning highlights our cognitive capacity not only to assess our results and adjust our goal-directed thinking and actions, but also to engage in a second metacognitive or reflective loop of thought where we evaluate the assumptions, briefs, thought processes, or cause-and-effect theories underlying our goals or behavior as well, or instead (see Wikipedia Double-Loop Learning). All or most of us of course naturally engage in both single-loop and double-loop thinking, or cognition and metacognition, as a regular and important part of our lives and endeavors. In practice, some amount of single-loop functioning may be essential to completing important tasks and navigating situational life generally, since excessive or protracted reflection or metacognition, and its tendency to engender high and action-inhibiting self-consciousness, can interrupt practical life and make us less focused, efficient, effective, or adaptive overall (see Wikipedia Self-Consciousness). At the same time, some amount, degree, or frequency of double-loop functioning or reflection is both natural and can be enormously valuable – notably, especially during both challenges and failures – by helping us to consider our cognitive framing and processing, our personal or group assumptions and motivations, and thereby our potential for more informed or considered and objectively superior situational perspectives, ideas, goals, framing assumptions, and plans (see Wikipedia Self-Knowledge, Self-Awareness, Situational Awareness, Psychological Mindedness, and Mindfulness). Before leaving this comparison of cognition and metacognition, and in case you were (metacognitively) wondering, the additional states of triple-loop thinking and still higher order levels of functioning are of course possible too – thinking or learning where we consider not only our cognition and behavior, but also the quality of our metacognition or reflective evaluations as well. Generally, this further elevated, but also more situationally abstracted or isolated functioning, will involve considering our or a group’s foundational ideas, assessment standards, ideals, principles in use, or processes for making evaluations. In practice, this mode of functioning will often take the form of deep why-testing or probing the reasons we are both functioning and evaluating our functioning as we are. As you may intuitively suspect, some amount of triple-loop thinking may be very valuable, but as with double-loop or simple reflective thinking, this looped or recursive functioning also naturally and perhaps increasingly risks pronounced, occluding, inhibiting, or regressing self-consciousness – and thus a halting, stilted, and less adaptive approach to life overall. By analogy, we can think of increasingly looped or reflective thinking as functioning in a growing hall of mirrors – offering interesting perspective but also making simple tasks more difficult and even vexing. As its name indicates and as outlined before, multi-dimensional thinking is the natural, but also waiting intentional and metacognitively seeking, practice of using multiple or increasing variables, factors, or considerations in our personal or collective thinking and functioning. And as I suggested, in both forms it is a process or practice that can greatly improve the quality, effectiveness, or accuracy of our thinking, resulting actions, and subsequent evaluations. In keeping with my introductory comments, recurring theoretical and empirical analysis suggests that multi-dimensional thinking is not only natural, but a highly valuable and even essential practice in modern life and endeavor as well, and again notably whenever we face complex and uncertain conditions or challenges (for a survey of relevant theory and research, and perhaps thinking of each useful added dimension of thought as increasing our sample set, see Wikipedia Cognition, Uncertainty, Statistics, Type I & II Errors, Type III Error, Decision Theory, and Decision-Making). To bridge our overall discussion, let me point out that multi-dimensional thinking is related to metacognition in at least four ways. One is that metacognition is of course multi-dimensional in itself. Second is that the selection of multiple factors for a thought process, loop, or mental model, will generally require metacognition or significant reflection and analysis in itself. Third is that multi-dimensional thinking and models normally or naturally draw attention to themselves, and thus tend to invoke metacognition or considerations of the thought process or model’s components, assumptions, and effects. And fourth is that multi-dimensional thinking, importantly like metacognition in both its double-loop and higher order varieties – and really, all natural functioning – is similarly subject to natural inadequacy, error, and excess. 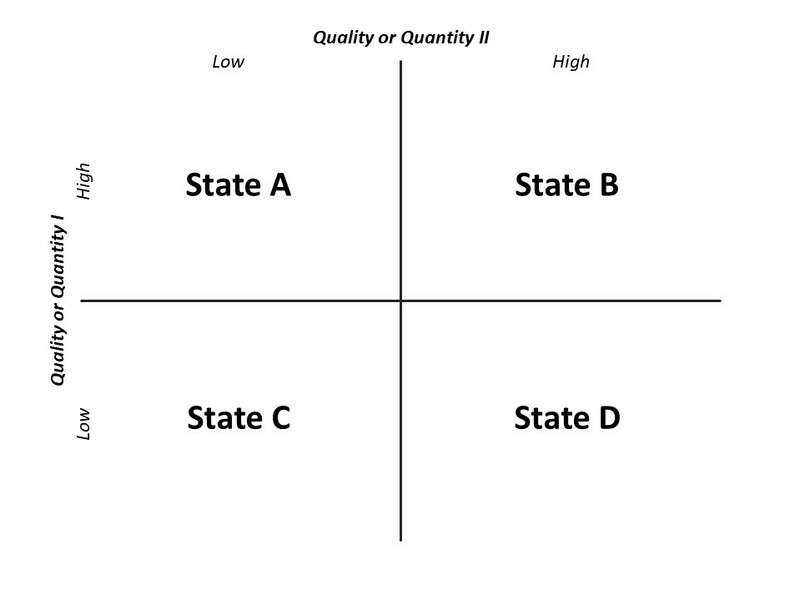 While all three of these less desirable states are important, the last is perhaps most relevant for our discussion, and crucially can result in the familiar outcomes or phenomena of analysis paralysis, diminishing and then negative returns on intellectual or empirical investments, and inadequate natural satisficing (see Wikipedia Analysis Paralysis, Diminishing Returns, Negative Return, and Satisficing). Overall, perhaps the most common and even most valuable form of multi-dimensional thinking in everyday life and effort involves what I will call data tables of varying degrees of formality, where at least two and perhaps many different factors, attributes, or dimensions are compared and considered against one another. A simple example of this tabular comparison or modeling of information is shown in the graphic above, which is visually two-dimensional – or has two framing or organizing dimensions – but substantively has more content or processing or content dimensions than this, and could have many more of course. 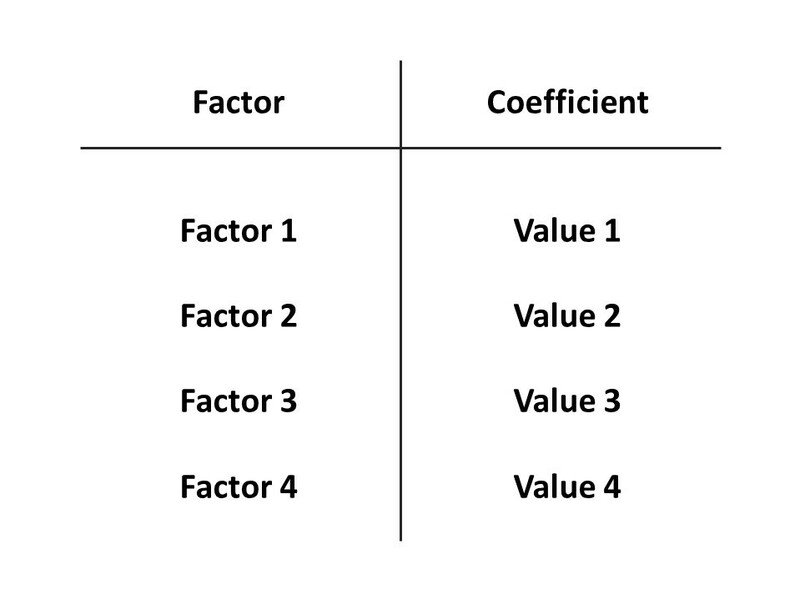 Importantly, however, given this fairly formal example of a data table, it is crucial for me to underscore that such tables or tabular thinking can be entirely cognitive, mental, or implicit (as when we mentally compare potential choices or options against various criteria or considerations). Overall, data tables, the tabular or database organization of information, and similar tools or approaches to thought can be understood as multi-dimensional contrast models. And importantly, they can be either quantitative or qualitative in nature. There are at least two immediate, important, useful, and similarly common variations or extensions of this basic tabular approach to or method of multi-dimensional thinking. One is the conversion or translation of data tables into useful graphical charts and plots, which notably for our discussion are also often along two dimensions visually, spatially, or organizationally, but may contain many more dimensions of information substantively. In any case, organizing graphical plots and charts, as the graphics we are using themselves highlight, can be enormously useful and help us to see essential relationships, and notably in structurally simple but nevertheless unintuitive or ambiguous sets or tables of data – or in situations or amid challenges with these information or cognitive qualities. 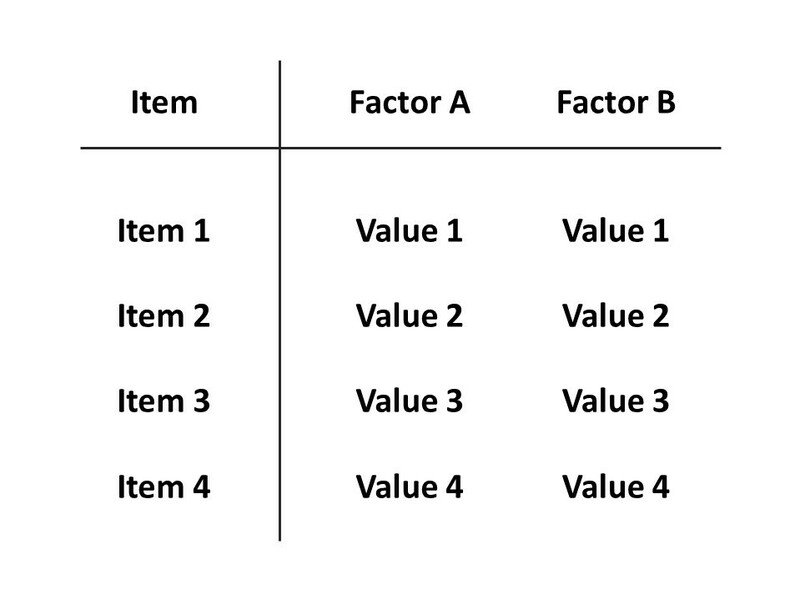 A second extension of data tables, also involving two-dimensional plots or organization of various information elements, are today’s ubiquitous use of 2×2 or four-quadrant matrix models by analysts of all kinds (a prototypical example of which is shown below). In practice, matrix models or charts, like two-dimensional organizing data tables and plots, are a simple, effective, and intuitive aid to multi-dimensional thinking. And like these other tools, and perhaps especially when focusing on essential qualitative differences, matrix models often can sometimes offer comparatively deep insights into fundamental patterns or relationships, whether in a particular data set or the data set that is the world broadly, and especially compared with unaided thinking. For example, consider a matrix plot of a large number of potential endeavors, or potential escapes from thinking life if you want, against the essential (and metacognitively surfaced) qualities of safe and valuable – as opposed to perhaps more intuitive, visceral, or monolithic considerations of exciting and easy – and you perhaps can see how such multi-dimensional graphical aids might help us and our groups better visualize options and in turn function in vastly superior ways – amid and throughout life, and thus compoundingly or increasingly so. Together, information tables, data plots, and matrix models are often revealing, insightful, and powerful techniques to understand, promote, and aid simple multi-dimensional thinking. Quite often, they will be fairly intuitive and persuasive, and frequently will strike a good balance between expediency and complexity – between too few and too many variables or dimensions, too little and too much reflection or metacognition, and overly rapid and unduly protracted satisficing. But sometimes, these forms of or tools for multi-dimensional thinking can be too simple, crude, imprecise, and even wholly wrong or misguided – reflecting a phenomenon known in mathematics as omitted-variable bias (see Wikipedia Omitted-Variable Bias). In these cases, and with the aid of metacognition, either replacement of variables or added ones are essential to ensure that our thinking, cognition, processing, or modeling is adequately effective or adaptive – relative to our tasks or goals, the situations we face, or the natural opportunities before us, seen and unseen. In these cases, and of these two options, exploring replacement variables within a tabular or two-dimensional organizing framework, rather than adding model or organizational complexity, is often superior, especially initially. This is because more procedurally or spatially intricate mental or graphical models, and therefore more intricate information framing, can prove unwieldy, unintuitive, error-prone as a result, just as with excessively looped or convoluted thinking more fundamentally, and thereby either unhelpful or unpersuasive in practice. Overall, and in contrast to excessive simplicity or overly simple thinking, these outcomes again highlight the natural risks waiting in excessive complexity of thought. 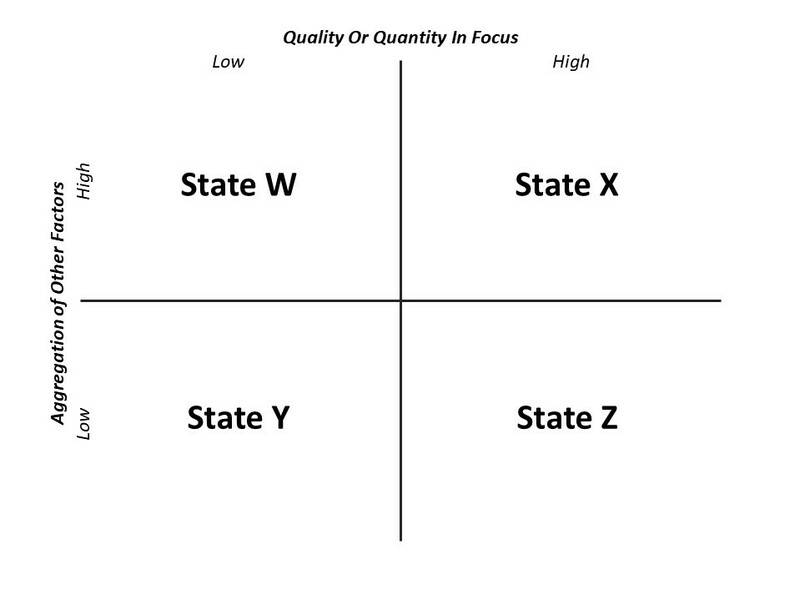 As an example of this, and for an immediate sense of the phenomenon of compounding or galloping metacognitive, organizational, or framing complexity, examine the seemingly simple move from two to three visual, spatial, or organizing dimensions in this chart, and then consider the prospect of adding still more organizing or framing dimensions. Importantly, when additional rather than replacement variables are needed or unavoidable, but before moving to more intricate model frames or formats, another and often superior consider a switch to alternative organizing models or framing, especially ones that are still relatively simple, intuitive, and communicative. In general, this step will involve (again metacognitively) reframing or rethinking the way we approach a question, challenge, or issue. One option in this approach, and a fairly recent innovation historically, is to move from tabular or contrast models or framing to system or process maps, models, or framing, which my very first graphic above is a simple example. In many cases, this lateral change to alternative low-complexity framing will be more useful, incisive, or insight-rich than a degree change that more simply, perhaps less reflectively, or mono-dimensionally increases a contrast or other existing model’s complexity. Sometimes, however, rigorous multivariable or multi-dimensional analysis is either unavoidable or highly desirable to achieve adequate richness in the way we or our groups think and understand issues or information before us and world more broadly, here including ongoing moves to use or leverage artificial intelligence and machine learning (see Wikipedia Multivariate Statistics, Artificial Intelligence, and Machine Learning). As you may know, multivariable analysis and machine learning involve a set of mathematical techniques that require training and care, but can provide essential and far-reaching insights that would not be available to us otherwise. And while the topic of multivariable mathematics and related data tools are beyond the scope of our current discussion, one central feature of this mathematics and its application is very much at the heart of it. This is the typical mathematical practice of summarizing or organizing complex results in a two-dimensional tabular format or frame, either as shown prototypically immediately above or in that of two-dimensional organizing equations (ones with length and depth, rather than length and height). Importantly, this common final step in multivariable or regression analysis offers basic insights into the workings and needs of our human minds. It is also a study in natural demands for simplicity or clarity and satisficing or expediency in human cognition, and likely in all cognition. And crucially, it suggests a means or alternative way to conduct complex multivariable analysis and manage multi-dimensional thinking within simple information models or framings, and perhaps with sufficient rigor and adequate results in a many cases. This final technique of our discussion, summarized in the graphic above and again inspired by tabular and equational summation of multivariable mathematics, involves consciously or metacognitively collapsing, consolidating, or replacing multiple variables, factors, consideration, or lines of thinking with a single meta-variable, factor, or quality. As you likely can immediately sense, this will typically result in radical model simplification to a small number of variables, enable simple organization or framing of complex information, and potentially permit simple and intuitive, but still complex and probing, multidimensional thinking, understanding, and predictive analysis. This deliberate consolidation of variables of course contains the potential for oversimplification and substantial error or bias, but it nevertheless can be an enormously useful way to achieve relatively sophisticated multi-dimensional thinking, analysis, modeling, or information processing without complex, costly, unintuitive, and potentially error-prone information framing. Importantly, the approach also underscores two important and related features about all information and thought, cognition, and metacognition, ones with which I will end our discussion with – and encourage you to consider both these ideas in themselves and the insights into metacognition and multi-dimensional thinking they may inspire. One information feature is that all or many of the proposals, factors, or ideas we may consider in life are normally part of one or more larger concepts, categories, or meta-qualities, and thus at times may be metacognitively and helpfully recast, re-framed, reorganized, or sublimated into these more categorical or sweeping terms (see Wikipedia Categorization). For example, and as with my three examples immediately above, our or a group’s concerns about a particular threat or opportunity may be reconceived as part, examples, or instances of larger concerns or thinking about security and growth, respectively. The second feature is the reverse of this concept, or the idea that whatever information or thought we are considering, it almost inevitably contains sub-information, sub-factors, sub-ideas, or sub-qualities – ones that may be more or less helpful to our thinking and functioning at any point in time, and ones that, just as with identifying more categorical concepts, often can be accessed only with some amount of metacognition or reflection, and perhaps only with awareness of the potential and importance or multi-dimensional thinking. Together, and as suggested earlier in our discussion, these two feature of information suggest that optimizing all cognition, metacognition, framing, and functioning more generally involves finding degrees of information organization or specificity, as well as information connection or interrelationships, that are progressively useful, efficient, effective, or adaptive. In this way, the (re-framing) movement from more generic or categorical to more specific or instantial factors, or the reverse, can be essential to multi-dimensional thinking and modeling in all its forms, and just as with seeing or probing more essential relationships between the factors we have at hand. In theory and practice, both steps can be crucial to high-quality or adaptive descriptions of and predictions about the world, whether in our lives and our groups. And each move circularly requires and encourages adaptive metacognition, a natural and advanced human trait I would encourage – and do in my new book – you and your groups to consider and employ, often and richly. Let me know what you think in the comments section below. 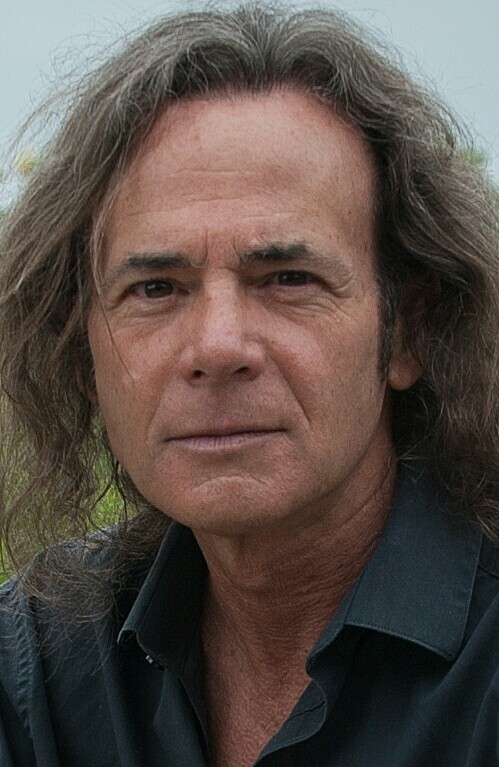 Tell others about Mark and his transformative Natural Strategy method! This entry was posted on June 19, 2018, 6:01 pm and is filed under Strategy Insights, Strategy Practices. You can follow any responses to this entry through RSS 2.0. You can leave a response, or trackback from your own site.